A delegation of representatives from Stavropol recently visited India to look at possibilities of cooperation in agriculture, education, manufacturing and technological exchanges. 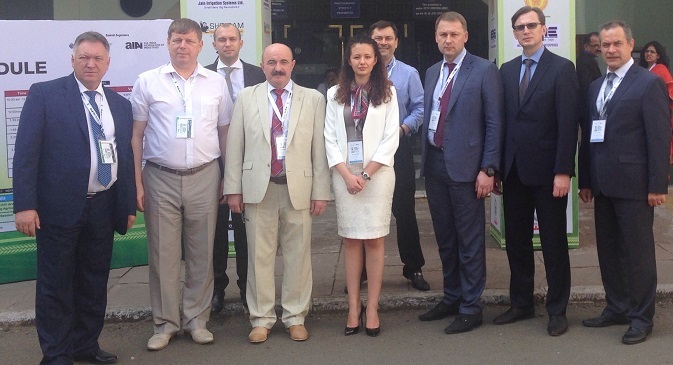 A delegation from the Stavropol Region, or Stavropolsky krai, which occupies a unique place within the North Caucasus District of South-Western Russia, visited India for a three-day visit organized by the region’s department of inter-regional and international cooperation. Headed by Andrey Murga, Deputy Head of the Stavropol government, the delegation participated in the 5th Global Economic Summit (GES) held in Mumbai’s World Trade Centre (WTC). Promoted by the All India Association of Industries (AIAI), the summit aimed at discussing key trends in agriculture, food processing and related industries through knowledge and experience exchange between experts from over 30 countries. Murga participated in a panel discussion on 'Food Production Systems: Emerging Trends and Global Challenges,' sharing concerns about Stavropol’s agriculture sector with Indian and international colleagues. “Participation in this summit was a good start for future cooperation between companies of Stavropol region with potential business partners from India in order to increase exports of agricultural products, as well as to attract investments in various agricultural projects in the region,” Murga told RIR on the sidelines of the Summit. Stavropol is interested in building relations with Indian partners in various sectors, from agriculture to pharmaceuticals and manufacturing. “We consider several key areas of joint cooperation. Firstly, the exports of agricultural products, like wheat, flax seed, sunflower seeds, corn, canola and wool. We may be interested to import tea, coffee, rice, vegetables and fruits from India. We are also interested in joint ventures in production and processing of industrial crops, primarily sunflower, and establishing full cycle production and processing of vegetables, including potatoes,” Murga said. The Stavropol region is looking for more Indian investors to come there, citing possible technological exchanges in spheres of agriculture and food production between Stavropol universities and research centres and Indian partners. As the region is seeking more FDI inflows, Stavropol’s government is working on developing better infrastructure to support businesses and investors in agriculture, pharmaceutical and chemical industries, promoting innovations and better dialogue between business and government. The delegation also met Indian cheese manufacturers, Corona Dairy. “We were surprised to know that such quality manufacturing is taking place here in India,” Murga said. He added that Stavropol too, is known for advanced technologies for cheese making. The region will likely cooperate with the Satara-based Corona Dairy for technology exchanges. The regional delegation held meetings with several Indian companies, including Reliance Industries, and the KGK Group which deals in coloured gemstones, diamonds and jewelry manufacturing and trade and has a presence in Russia. They also met the management of Berger Paints, a leading Indian paint company with an international presence in three countries, including Russia. Berger Paints has chosen to set up a plant for paints and varnish manufacturing in the town of Nevinnomysk, Stavropol’s industrial park. Berger Paint is planning to invest $ 20 million initially, Murga said. However, Region's Deputy Head noted, the construction of the factory has not yet started and will probably take another two years. Earlier this year, Vladimir Vladimirov, the governor of Stavropol, and Kuldip Singh Dhingra, owner of Berger Paints, signed an agreement in New Delhi. “About 90 per cent of Russia's domestic paints market is taken by imported paints. Establishing the manufacturing unit in our region will allow it to increase the share of Stavropol's local products in the market, and support our engineering capacity through creation of new high-tech jobs,” Murga said, commenting on the deal. The plant in Nevinnomysk will be the company's second investment in Russia. Berger Paints’ first Russian unit has been operating for almost a decade in Enem, in the Krasnodar Region. The Russian business is under Berger India’s subsidiary, Berger Paints Overseas Ltd.
Stavropol boasts a unique geographical location, climate and natural resources base that define its economic prosperity and investment potential. The city of Stavropol, the administrative centre of the region, has a population of around 420,000 people. The region is ringed by the northern Caucasus mountain range. Other largest cities of the region are Pyatigorsk, Kislovodsk, Nevinnomyssk and Essentuki. According to Stavropol’s ministry of economic development, the fastest growing industries of the region are agriculture, particularly segments like flour milling, poultry and meat packing, and cheese and wine making, among others. Manufacturing is another large contributor to the high GRP (gross regional product) that, in 2013, stood at 478.4 billion rubles (US $14.5 billion at 2013 rates). According to Russia's 2014 national ranking of regions, based on their socioeconomic performance, Stavropol ranked 37th among 83 regions. Stavropol is also known for its medical, agricultural, linguistic, and teacher-training universities and institutes as well as agriculture research centres.